'Evening Post Building.' From King's Handbook of New York City, 1893 edition, p. 611. Completed in 1875, the same year as the Tribune Building, the headquarters of the of the Evening Post was an imposing ten-story, 140-foot tall structure that stood on the southeast corner of Broadway and Fulton Street. Like the Tribune, it was a load-bearing brick structure with stone trim, but its vaguely Romanesque style was restrained and utilitarian, with the exception of a low mansard-like cupola above the central bay and heavy stone piers and columnettes that framed the main entrance. The architect was the little-known Thomas Stent, who took over the commission from an earlier architect dismissed from the project. 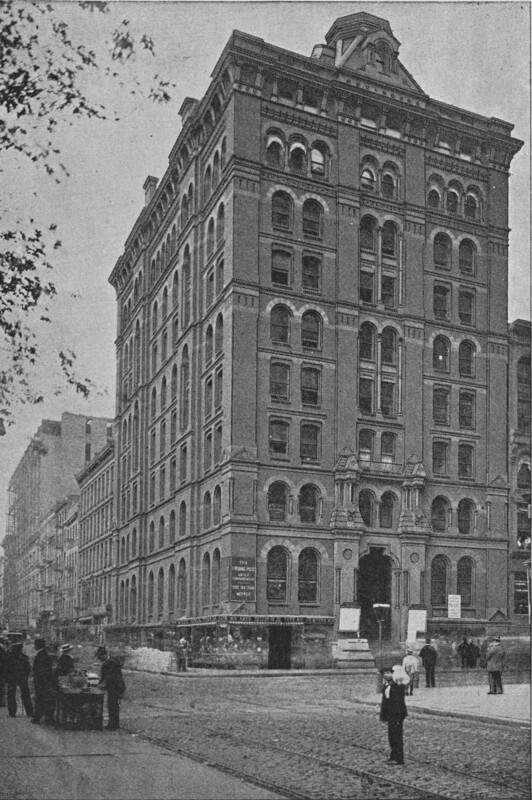 The Post wrote in its July 1, 1875 supplement on the new building that its simplicity would be "admired more for its massiveness and substantiality, and for its complete adaptation to the uses for which it was constructed, than for anything peculiar or striking in its outlines or extravagant in the treatment of its interior." The main Broadway entrance, raised a half-story above street level, as was common at the time, led to the major commercial spaces and the lobby access to the hydraulic elevators. The upper floors were partitioned offices, all leased to tenants except for the top floor, which was reserved for the paper's editorial offices and space for the compositors. The printing presses and other machinery operated in the basement levels, and compositors of the job-printing department worked in the vault spaces below the sidewalks on Broadway and Fulton Street. The New-York Evening Post was originally established in 1801 by Alexander Hamilton and his political allies as a Federalist broadsheet after the election of Thomas Jefferson to the presidency. Famed poet and abolitionist William Cullen Bryant took over the paper in 1828 and served as its editor-in-chief for fifty years. The Post changed its format from broadsheet to tabloid in 1942, under the tenure of Dorothy Schiff, after which circulation grew by two thirds. Media mogul Rupert Murdoch purchased the paper in 1976.